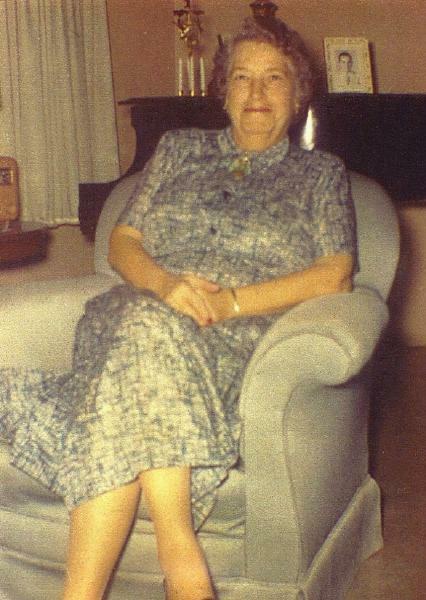 Frances Ilene Adams was born on 22 March 1891 in Devine, Medina County, Texas. Walter Benjamin Adams and Lizzie Cook appeared in the US federal census of 1 June 1900 in Medina County, Texas. Other members of the household included Frances Ilene Adams, Hallie May Adams and Tom Temple Adams. She married Ellis Franklin Gates on 16 September 1909 in Devine, Medina County, Texas. The following appeared on 19 September 1909 in The Galveston Daily News: (Devine) The Wedding of Dr. Ellis F. Gates of Lytle and Miss Fannie, the only daughter of the late W. B. Adams, took place Wednesday night at the Methodist Church before a large assembly. Dr. John E. Harrison of the San Antonio Female College performed the ceremony. Messrs. Oscar Forrester and Debrell Whitfield acted as ushers. The wedding march was played by Miss Minnie Briscoe, Misses Stella and Kate Briscoe and Miss Ethel Lynch of Kingsbury being bridesmaids, and Miss Dawn? Cook was maid of honor. Mary Kate Wipff was flower girl, Temp Adams was cushion bearer and Messrs. Charles Burmeister, Ellis M. Bush and Sterlin Robertson Jr. were groomsmen. After the ceremony a reception supper was given in their honor by the bride's mother. Ellis Franklin Gates and Frances Ilene Adams appeared in the US federal census of 1 January 1920 in Eagle Pass, Maverick County, Texas, at 409 Ceylon Street. Other members of the household included W. B. Adams Gates and Mary Elizabeth Gates. The following appeared on 19 March 1928 in The Dallas Morning News: (Eagle Pass, March 18) While trying to rescue his sisters, who were sleeping upstairs, W. B. Gates, 15, son of Dr. and Mrs. Ellis Gates, Eagle Pass, was burned to death in a fire which destroyed the home early Sunday. Dr. Gates rescued his daughter and baby by climbing down a tree which stood near the house. The following appeared on 21 March 1928 in La Prensa: (Eagle Pass, March 19) On Sunday morning, the 18th, this normally peaceful town awoke to sadness and desolation because of what happened in a terrible event to an honorable family, whose, character and involvement, enjoy a special place of esteem in both neighboring towns. We refer to the Gates family, composed until yesterday, of the head of the family, Dr. Ellis F. Gates, his wife Frances Gates, and their three children, W.B., Susie, and little Frances, to which has transpired one of those catastrophes that leaves an indelible imprint on the victims and those that are bound by ties of affection and gratitude. At about three thirty in the morning, while preparing to leave on a hunt, Dr. Gates, his son W.B., seventeen years old and a friend, Larry Harper, without knowing what caused it, yelled that there was a violent fire in the upper part of the house where the children, Susie and Frances slept, accompanied by a maid. Mrs. Gates had gone on a short trip to San Antonio, Texas. The servant was awakened and alarmed and the Doctor rushed to the stairs which were burning but he was able to climb, receiving burns to the face, to help his daughters. He yelled at W.B. to call the Fire Dept. In great danger and difficulty Dr. Gates succeeded in bringing down all three that were on the second floor by climbing over the roof and down a tree on the other side of the house. The baby and servant receiving only slight burns. Meanwhile, the son, believing that his father and sisters were in great danger, sought to climb the stairs that were completely engulfed. The stairs collapsed in raging flames and buried him. The doctor searched in vain for his son along with many who had come to help, until someone found him in the rubble of the house that was reduced moments later to ashes. Moments after extinguishing the fire the mother arrived on the train from San Antonio and the scene that took place with the family, that moments before were happy, is impossible to describe for how terrible and heartrending it was. All day the grieving family received condolences from many friends, countless from this city and also from Piedras Negras, in the home of E.R. Jones where they are temporarily lodged. At six in the afternoon a funeral cortege was organized for the unfortunate boy, being one of the most well attended that had ever been seen, leading to the Episcopal Church situated in front of the Plaza de San Juan, received by the Rev. J.S. Moore on the portico. At the church impressive ceremonies took place after which the cortege proceeded to the cemetery where the funeral rites concluded. Ellis Franklin Gates and Frances Ilene Adams appeared in the US federal census of 1 April 1930 in Eagle Pass, Maverick County, Texas, at 577 Ceylon Street. Other members of the household included Mary Elizabeth Gates. The following appeared on 28 September 1930 in the San Antonio Express: (Devine) Mrs. Ellis F. Gates was the guest of her [step]mother, Mrs. W. B. Adams, during the week and was accompanied home by Mrs. Temple Adams and son, Tommy7, who will be the guest of Mrs. Gates in Eagle Pass for several weeks. . . . Mrs. W. B. Adams left on Tuesday for Harlingen, where she will be with her sister, Mrs. Norman Marshall, for several weeks' visit. Ellis Franklin Gates and Frances Ilene Adams appeared in the US federal census of 1 April 1940 in Eagle Pass, Maverick County, Texas, at 577 Ceylon. Other members of the household included Mary Elizabeth Gates. In 1935, daughter "Susie" was living in Austin. Frances Ilene Adams died on 13 December 1963 at age 72 in Eagle Pass, Maverick County, Texas, at Los Caminos Farm . Her death was officially witnessed by Jeremiah Ingels Rhodes. At the time of her death Frances Ilene Adams was living in Eagle Pass, Maverick County, Texas, at 577 Ceylon. Her husband Ellis Franklin Gates became a widower at her death. She was interred at Eagle Pass (later Maverick County) Cemetery, Eagle Pass, Maverick County, Texas.